With its elegantly twisted front button closure, the Short Medieval Forest Cloak is a uniquely beautiful addition to any womans historic wardrobe. 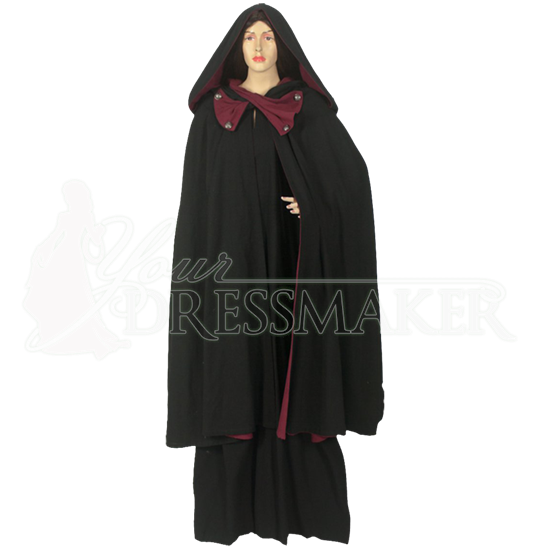 This reversible cloak features a different color on its inner and outer sides. Handmade from 100% natural woven cotton with a medium weight, this cloak is comfortable for wearing to Renaissance festivals, medieval and fantasy LARP events, and other historic reenactment occasions, and its oversized hood will lend its wearer an aura of mystery. This stylish reenactment cloak falls below the knees but above the feet, retaining a voluminous and full look that will not get in the way of the wearers movement.